Room Ideas : Foyers/Entry : Make a Grand Entrance! Be inspired by ideas for hallways and impress any visitor to your home! Someone once said, "you never get a second chance to make a first impression" - how true! The hallway is the main entrance into most of our homes - and it�s a chance to impress your guests as they take their first steps through your front door. 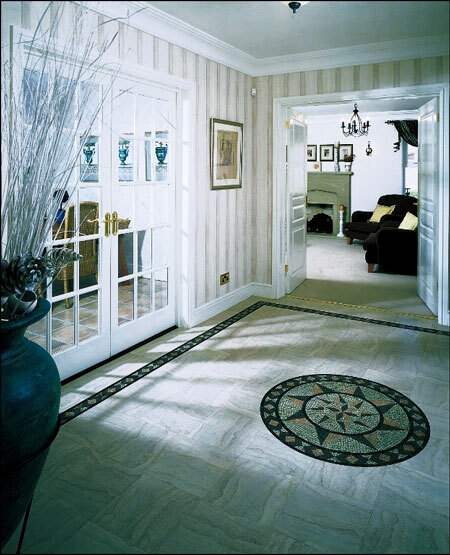 In a busy area like a hallway, the flooring needs to be particularly practical. But that doesn�t mean you have to compromise on design. However, too much detail can make a hall appear cluttered. So keep your interior scheme simple, and focus on one strong element to make a visual impact and a grand entrance. Adding a fabulous motif to your floor is a wonderful way to add drama and impact to a hall. Keep the wallcoverings simple and the paint colour neutral. Choose light fittings with clean lines and don�t overdo the accessories. Choose from ten Amtico motif designs which can be recoloured to suit any interior scheme. For a traditional look, we love the Apollo Motif in woods. A mosaic motif in either San Marco or Medici designs will add classical elegance. You don�t have to have a large hallway to add a motif - the Small Star Motif will add a focal point to the smallest area. Click here for more information about Amtico� Vinyl Flooring.